A transition day, stage 13 crosses the Po Valley from south to north on relatively flat roads before climbing to the town of Montello. 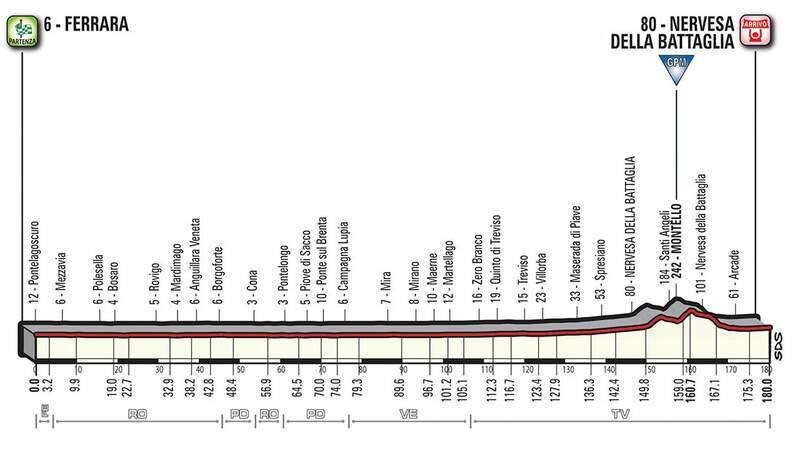 The final 30-kilometer circuit features a few climbs, but likely won’t be enough to prevent a sprint finish. Elia Viviani (Quick-Step Floors) sprinted to win stage 13 of 2018 Giro d’Italia in Nervesa della Battaglia. The Italian emerged from the bunch at the last minute to beat Sam Bennett (Bora-Hansgrohe) and Danny van Poppel (LottoNL-Jumbo) and win his third stage of this year’s edition. Overall leader Simon Yates finished safely in the peloton and the GC remained unchanged. After a few difficult days, Viviani was ecstatic with his win in his post-stage interview. “It’s amazing, after a few difficult days, this is what I and the team need. Sam Bennett, the runner-up on the stage, had arguably the fastest sprint in the finale, but wasn’t in the right position coming into the final few meters. “I couldn’t get on the right wheel. I had to come from very far back. I think I was the quickest in the final, but I just couldn’t get out. There will be another day,” said the Irishman. The 180km-stage from Ferrara to Nervesa della Battaglia in the Veneto region was a textbook sprint stage and featured little action early in the stage. However, the final kilometers were marked by indecision with any one team unwilling to take up the pace. The early breakaway looked like it may have a chance to make it to the finish line, but was finally reeled in with 6km remaining. Even after the catch was made, the teams of the sprinters were hesitant to commit to a high pace. A Wilier Triestina rider attempted to take advantage of the lull with an attack with just over 1km to go. The move looked promising until Sacha Modolo (EF Education First-Drapac) opened up the sprint early. Viviani waited patiently until he found a clean line through the messy sprint, but when he launched his sprint, no one could match his speed. The Italian was able to show the rest a clean pair of heels as he crossed the line. In his post-race interview, race leader Simon Yates was happy with the calm stage and looking forward to the weekend. When asked what he knew about the feared Monte Zoncolan, Yates admitted his knowledge was limited. Tomorrow’s stage traverses the eastern Dolomites and includes five categorized climbs and more than 14,000 feet of total elevation gain. The stage finishes on the much-feared Monte Zoncolan, with gradients of 22 percent in its first half, the Giro could be won (or lost) on this climb.